The Flanders Collection from Liedekerke, led by Bruno Van Den Brande and Yannick De Ridder, have clearly left their mark on the international competition in recent years. Fanciers from across the globe have visited their loft to obtain pigeons of some of Belgium's signature bloodlines. - they have dominated the KBDB ace pigeon competitions since 2013, each time with at least five 1st National Ace Pigeons that are related to several bloodlines of the Flanders Collection. With so many invaluable bloodlines in the Flanders Collection, it would be almost impossible to talk you through every top class bird in this loft. Instead we decided to pick four absolute champions (all from 2017) of this current generation, four regular winners with fantastic origins. BE17-4231042 'Blauwe Olympiade 042' is a great bird. This hen claims 8 first prizes (no doubles) and she wins 11 prizes in the first 1%. Here are few results: 1/1,176 birds, 1/575 birds, 1/456 birds, 1/366 birds, 1/216 birds, etc. She became 1st ace pigeon Noyon in 2018 (best coefficient). As her name suggests, this hen is a 100% Leo Heremans. The sire is a son of 'Broer Safir' (Safir - 4 x first prize - is a son of Olympiade of Gust Jansen) x 'Daughter Jan' (De Jan - stock breeder of Leo Heremans and winner of 6 first prizes). The dam is 'Beauty Blake', a half sister of Blake, 1st National Ace Pigeon KBDB and a granddaughter of Nieuwe Olympiade of Leo Heremans. Her fantastic pedigree can be found here. Another star in this team is BE17-4231037 'Super 37 Kittel', a super class hen and winner of 4 first prizes in 2018, and 11 prizes in the first 1%. He wins for instance a 1/407 birds, 1/375 birds, 1/316 birds, 2/1,185 birds, etc. She was 3rd ace pigeon in Entente Noyon (best coefficient). She comes from the best bloodlines of Dirk Van den Buck and Leo Heremans. Her sire is for instance a son of Beauty Bolt, which comes from a brother x son of world champion Bolt x Golden Red Kittel, a full sister of that other world champion Kittel, 1st National Ace Pigeon Sprint KBDB 2013 with the lowest coefficient ever: 0.9% with a 1/2,089 birds, 1/1,792 birds, 2/2,023 birds and 3/2,443 birds. The dam is New Golden Lady, winner of a 1/1,080 birds and 2/1,612 birds from Quievrain, and a daughter of Dubbele As, 6 prizes per 100 x Golden Lady, a daughter of Nieuwe Rossi x Eenoogske, the fantastic new breeding pair of Leo Heremans. The descendants of this line have won an impressive 32 first prizes. Click here for her fantastic pedigree. BE17-4231058 Super 58 Safyra Pair is another very successful hen with 8 first prizes to her name, including a 1/1,295 birds, 1/882 birds, 1/660 birds, 1/349 birds, etc. She became 1st ace pigeon Noyon (most prizes) in 2018, and 2nd ace pigeon Noyon (best coefficient). As her name suggests, she is a direct daughter of The Miracle Pair, 'Safier Supreme' x 'Daughter Jan Junior'. 'Safier Supreme is a full brother of some world class Leo Heremans birds, including Surprise (3 x 1st), Safier 076 (2 x 1st), Safier 142 (1st Nat. Ace Pigeon The Netherlands), etc., and a son of Safier, an excellent son of De Olympiade x the dam of Dubbel Aske, that same daughter of De Jan x Super 888 hen. This means Daughter Jan Junior comes from a talented son of De Jan, namely Jan Junior (4 first prizes) x a sister of Nieuwe Olympiade. This is another invaluable set of bloodlines, as you can tell from the pedigree. The last bird in our overview is a gem as well: BE17-4231040 Super Mealy 040 wins 8 first prizes and 2 first prizes in the Entente in 2018, including a 1/363 birds, 1/316 birds, 1/185 birds, etc. She was 2nd ace pigeon in the Entente (best coefficient). Her sire is Mealy Kittel, a direct son of Kittel x Goed Rood. 'Kittel' became 1st National Ace Pigeon Sprint KBDB 2013 with the lowest coefficient ever: 0.9% with 1/2,089 birds, 1/1,792 birds, 2/2,023 birds and 3/2,443 birds. Goed Rood wins 15 prizes per 100. The dam is Beauty Roeper, a direct daughter of the Leo Heremans stock pair Jan Roeper (son 'Jan' x 'Nathalia') x Kim (daughter 'Olympiade 003' x 'Mother Bourges'). This bird has fantastic origins as well! Click here for the pedigree. And Andreas Drappa (3rd National Ace Pigeon YBs in the 'Tipes' competition in Germany), Jozef Kusser (1st RV Verbandsmeister YBs 2018), Martin Stefll (3rd National Ace Pigeon (Tipes' competition in Germany), Les Green (UK), Herbie Thorpe (Ireland), and others have had some great results with direct descendants of the Flanders Collection as well. Click here for a full overview. 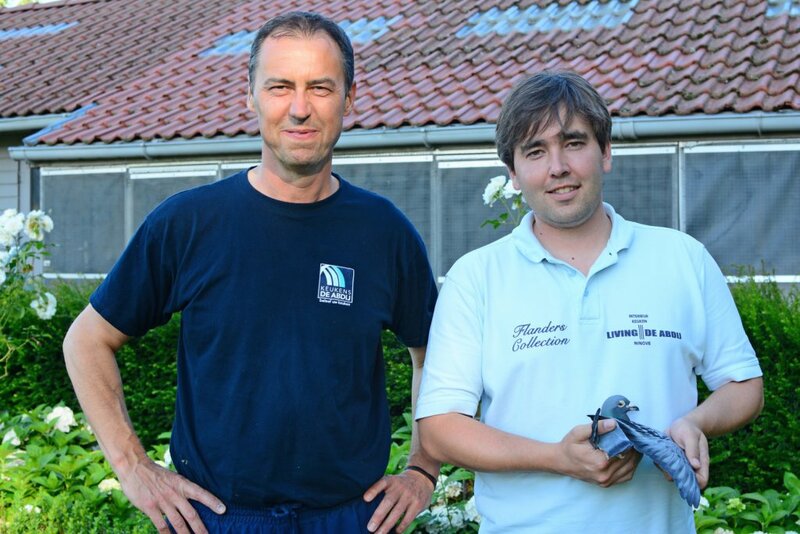 This loft has a solid future: they have many more successful season ahead of them, backed by the invaluable bloodlines of some of Belgium's best pigeon breeds kept in Liedekerke. And there is more: the team now enjoys the support of Paulo Campos, the man behind Campos - Flanders Collection, the Portuguese side loft of Flanders Collection. This loft closed the season with a 1st national champion middle distance, which marked the end of a highly successful adventure. It shows that the team from Liederkerke has a bright future indeed. 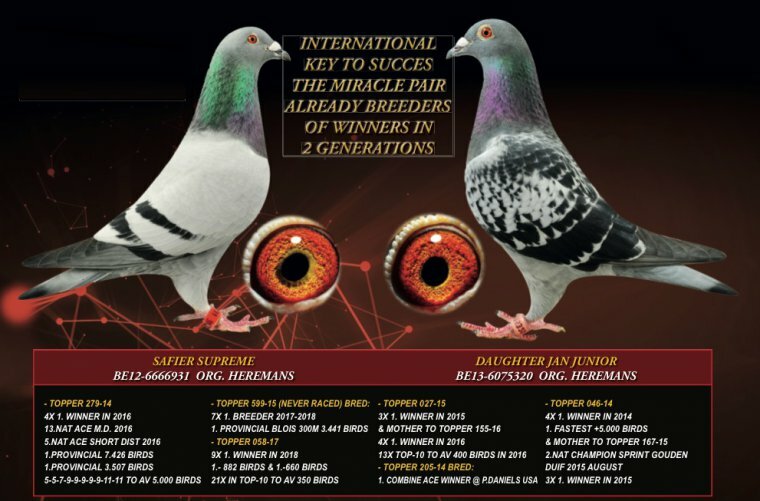 And even though it is quite difficult to compare fanciers and pigeon breeds across different generations, it looks as if a "new Jansen" has emerged, based on this loft's impact pigeon racing at national and international level. Just like the Jansen brothers, these fanciers have been able to conserve the genes of what is considered to be the perfect Belgian racing bird; this has become a trademark well beyond the borders of Belgium.